An experiment with paint, color and water on paper. I love torch firing beads and coating them with glass enamel. The bead is beautiful and the photo is beautiful too. 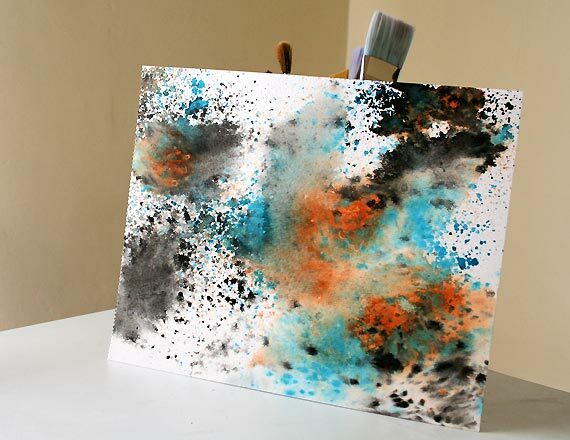 An experiment of paint, color & water on paper. 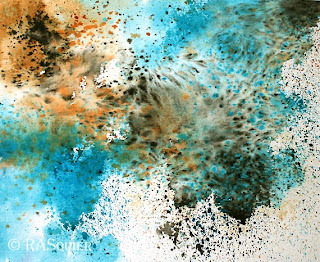 This one and more can be found in my Squier Etsy Shop section for Original Watercolor Paintings. I made a handful of bead charms. They can be used as zipper pulls, perfect for those little tiny zippers you can barely get your fingers around. Decorative little charm to add to anything with a little loop. More of my torch fired enamel beads. 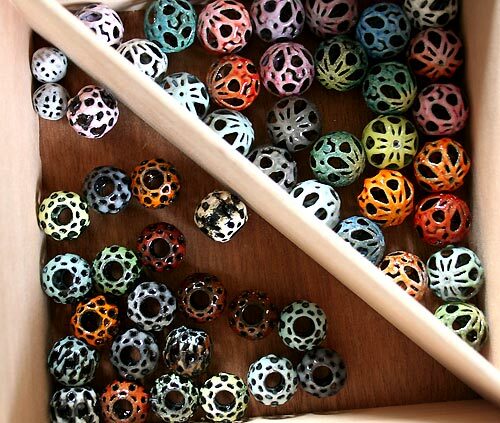 A variety of beautiful colors for the 18 mm loopy beads and the 14x16 mm woven beads. 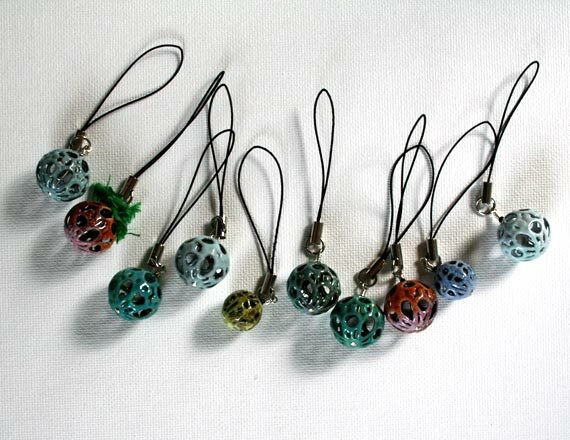 I love coating the metal beads with glass enamel using a small torch. The spinning of the bead, the choosing of colors, watching the colors blend, it's almost therapeutic. Sometimes the color combinations are a complete surprise. The nature of the torch, the variation of heat on where you place the bead in the flame, the mixing of colors, timing, so many variables. You just have to wait until the bead cools to see what you got! 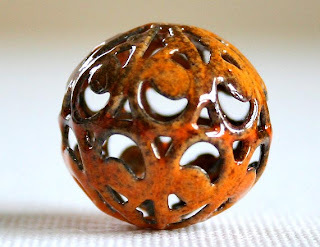 I have created lots of torch fired enamel beads. Here is a box filled with 20 mm of three different types of filigrees. My mission style beads, flower beads and paisley beads. I have created more beads than I can use myself. I love seeing what others can create with them. You can find my beads in my Squier Etsy Shop. 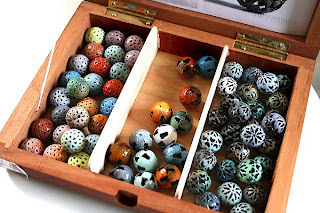 I have a whole section devoted to just Torch Fired Enamel Beads. I love torching the metal beads and coating them with glass enamel. I love color and playing with the colors. 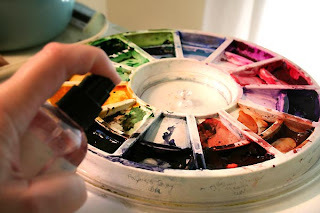 Depending on the brand of watercolor paint you're using, the time of year, the location or the age of your palette it may be necessary to mist your palette with clean clear water before you begin painting. This will help soften the paint and make it easier for you to pick up more color, more quickly. This is my very first palette of watercolors. I started painting in watercolors in 1995. All but two colors are Winsor Newton watercolors and they are the colors suggested by my first instructor. The two additions Sap Green and Permanent Violet Bluish are Maimeri Blu watercolors. The Winsor Newton colors consist of Paynes Grey, Brown Madder, Burnt Sienna, Alizarin Crimson, Cerulean Blue, French Ultramarine, Hookers Green, Yellow Ochre, Cadmium Yellow, Cadmium Orange and Sepia. Many of the colors have been replaced over time. However, the cadmium yellow and cadmium orange I know for a fact I have only purchased one tube of each of those. A little spritz of water before I begin painting and the paint works perfectly, like a charm. 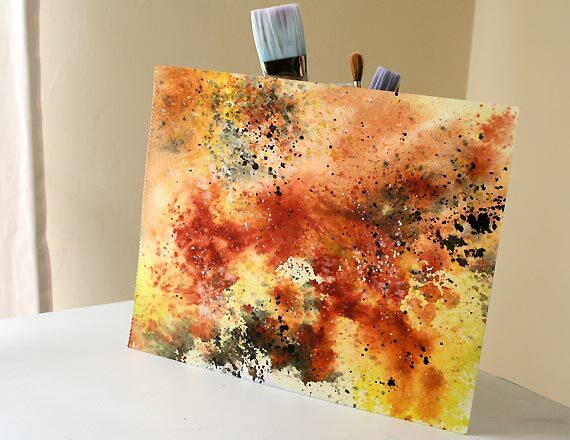 Yes, you can use that old watercolor paint palette! I created a new series of watercolor paintings entitled Obtuse Study. It involves an experiment of paint, color and water on paper. Scooter enjoys rearranging my desk, commandeering anything he believes should be his or may be fun. 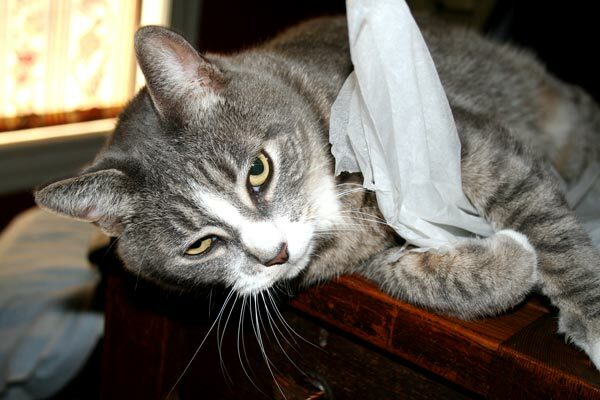 Two sheets of tissue wrapping paper now belong to Scooter. Tissue paper apparently is lots of fun! I hope you are enjoying your summer. Today was a busy day, but I found a little time to bake a tray of homemade scottish shortbread cookies and topped them with periwinkle sprinkles. Then I found the perfect bowl in my cupboards to place them into ... the cookies keep disappearing. 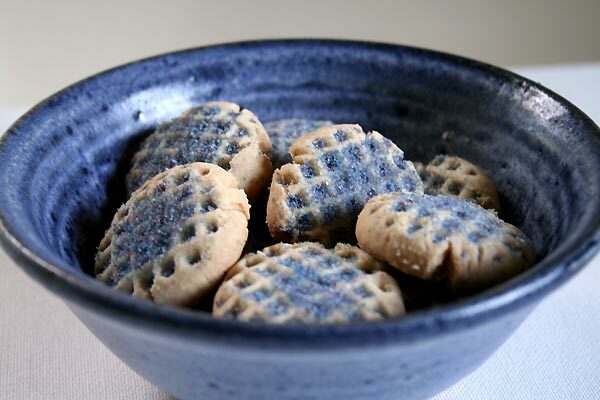 I've decided to call them my Periwinkle Shortbreads. I also noticed the bumper crop of raspberries growing on a raspberry bush that I tried to dig out of the garden last summer. Guess I didn't get all the roots. It only took ... oh ... 22 years to be able to pick this pretty bowl full. Tomorrow even more will be ready for picking. I have always wanted to be an artist! 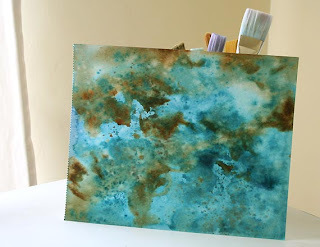 My Watercolor Paintings, Tuesday's Tips and Techniques for Watercolor Paintings and a few random fun posts and crafty stuff I've made is what you will find here on my blog. All images copyrights belong to me Rita Squier, the artist. No image may be used, downloaded, stored or copied in any manner without my express written permission. --Thank you. Have a great day & Happy Painting!